Brabo are fast becoming a well-recognised hockey brand on pitches right across Europe. It’s no surprise because their sticks are awesome; well-constructed, great specifications and cool looking designs. In the 2017 to 2018 hockey season, Brabo have a whole load of sticks to review and this article gives you the details you need to review to pick the best part of the range to buy a Brabo hockey stick. TeXtreme Series – Brabo’s top end hockey sticks are in the TeXtreme Series. TeXtreme is basically a brand name for a manufacturer of really high end carbon products. All of the TeXtreme sticks use the super light, super tough carbon fibre. LW12 Series – Dutch superstar hockey player Lidewij Welten teams up with Brabo to create a range of sticks this season. What I really like about this player sponsored range from Brabo is the sticks are available right across the spectrum of carbon content and prices. Most brands just create a high end stick sponsored by a player. Traditional Series – As the name suggests this Brabo range of sticks uses their traditional carbon construction, rather than the TeXtreme material. It’s still pretty great quality really and the Brabo Traditional Series sticks are nicely constructed. Tribute Series – Brabo Tribute series sticks are identified as the ‘TC’ models in the range. These are well constructed sticks with carbon and the triple core construction for increased power. Great sticks, superseded by other models with flasher carbon material but still really great quality at a great price. Heritage Series – A nice range of lower carbon sticks, really well priced. Best thing about the Heritage range is despite the low price, you can still buy the same stick shapes as the top end Brabo sticks. If you want to try a good quality lowbow for the first time, this is a great option for doing so. Pure Series – A few sticks make up the Brabo Pure series, these are good value entry sticks and a good stick for a part time player. This is a huge range from Brabo in 2017 and 2018, 27 different options for sticks and these aren’t even the Brabo Junior hockey stick to review for the season. While there are a number of differences in style and playability, you can narrow the choices across the range down to carbon content and shaft shape. Classic – The classic shaft shape from Brabo is a traditional midbow shape with a 24mm curve about 300mm up from the ground. Classic 16 – Some Brabo sticks have the Classic 16, which is in the same midbow position as the Classic, just a more subtle 16mm curve, a much straighter hockey stick. Low bow – Brabo’s low bow is a deep 24mm curve, positioned at 250mm up from the ground. Some of these Brabo sticks also have a 3D skills curve in the face and lower part of the shaft. Extra Low Bow (ELB) – Brabo’s low bow is as low as they go at 200mm up from the ground, it again has the deep 24mm curve. 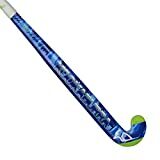 Extra Low Bow Drag Flick – Exactly the same shape as the ELB and these Brabo hockey sticks have an awesome drag-flick groove and more open face profile to assist with drag-flicking and 3D dribbling skills. Carbon content differences go right from Full 100% carbon to 40% carbon content in the Pure series sticks. So even the low price sticks are still a good balance of material. Brabo want to get known even more in the world of hockey and offering such quality sticks on a massive scale is definitely helping them achieve this. Not only do they look super slick, these Brabo sticks are really good quality and like the brand won’t be a season long disaster for you if you choose to buy a Brabo hockey stick. If you have some money burning a hole in your pocket then the TeXtreme material makes an awesome top end hockey stick. If you just want and decent stick that will last then something from the Pure or Heritage series will be a great buy.